Winter Storm Shuts Northeast; South Still Reeling : The Two-Way Heavy snow piled up from the Deep South through the Mid-Atlantic, and states to the north got hit as the day continued. Twenty deaths have been attributed to the storm. 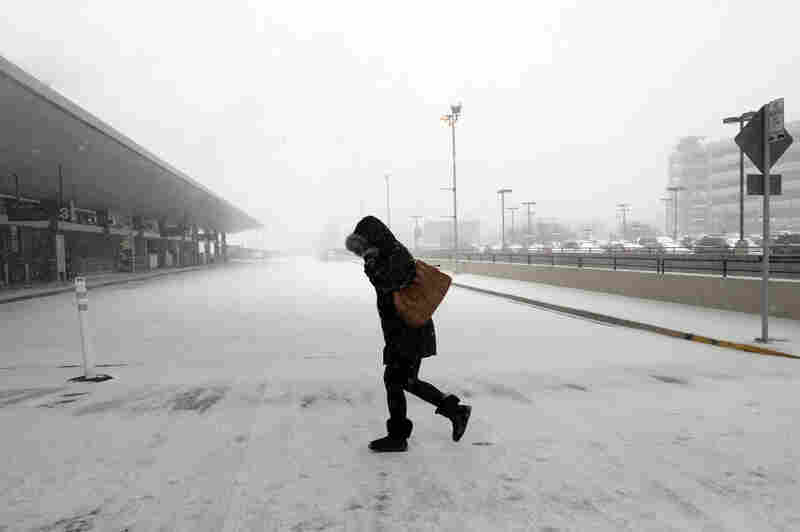 A pedestrian braces against the wind and snow on her way into Raleigh-Durham International Airport on Thursday in Morrisville, N.C. Flights were canceled across the region because of weather. 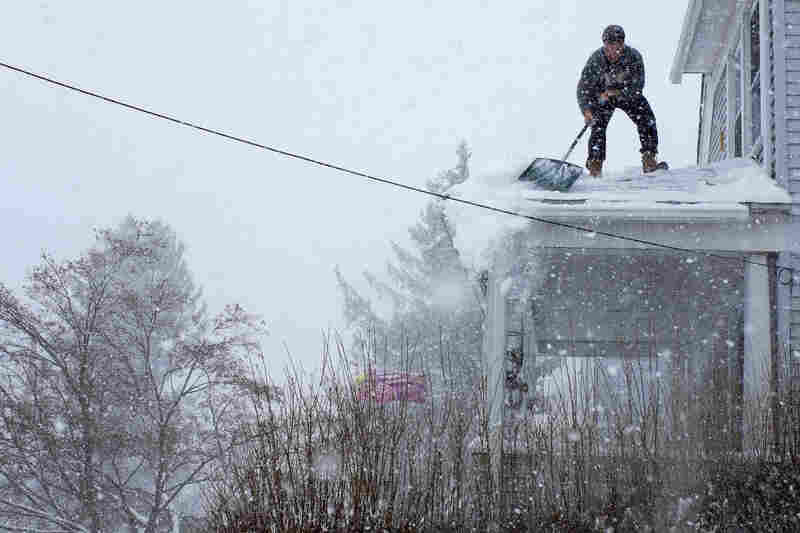 Chris Starace works to clear snow from his home's roof in Ossining, N.Y. According to the National Weather Service, "a wide swath of heavy snow accumulations are expected with this storm" Thursday and Friday from Maryland through Pennsylvania and New York and then on to Massachusetts and farther north. 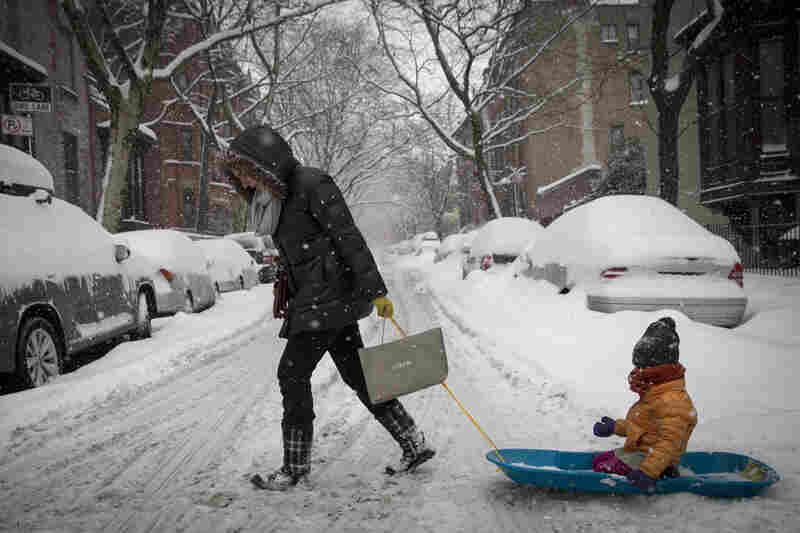 A woman pulls her child in a sled through the snow in Brooklyn on Thursday. Snow and sleet are falling along the East Coast, from North Carolina to New England, a day after sleet, snow and ice bombarded the Southeast. 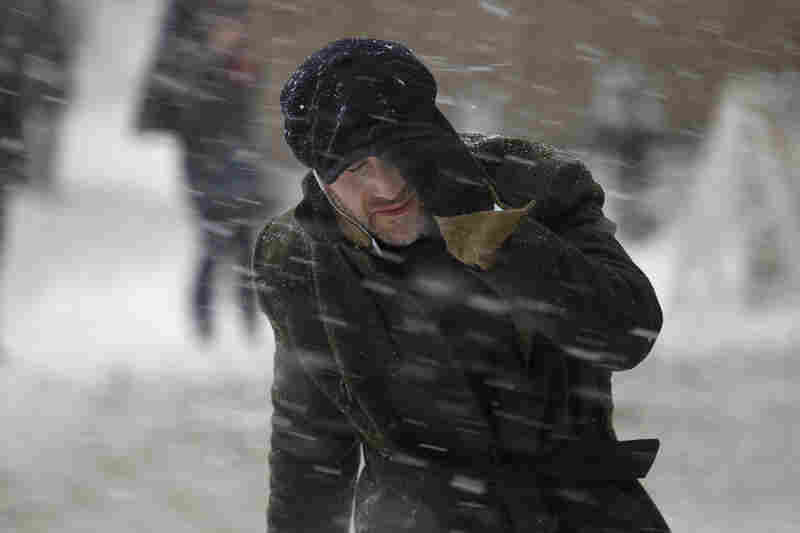 A commuter makes his way through heavy snow in New York City. A man jumps over a puddle in Washington, D.C. By midday Thursday, there were at least 20 weather-related deaths, according to The Associated Press. Multiple crews work to restore power after a winter storm brought down lines and continues to blow transformers in Fairburn, Ga. As crews worked to restore power to hundreds of thousands of Georgians, forecasters hoped warmer temperatures Thursday and a few rays of sunshine would melt ice-coated roads across the state. 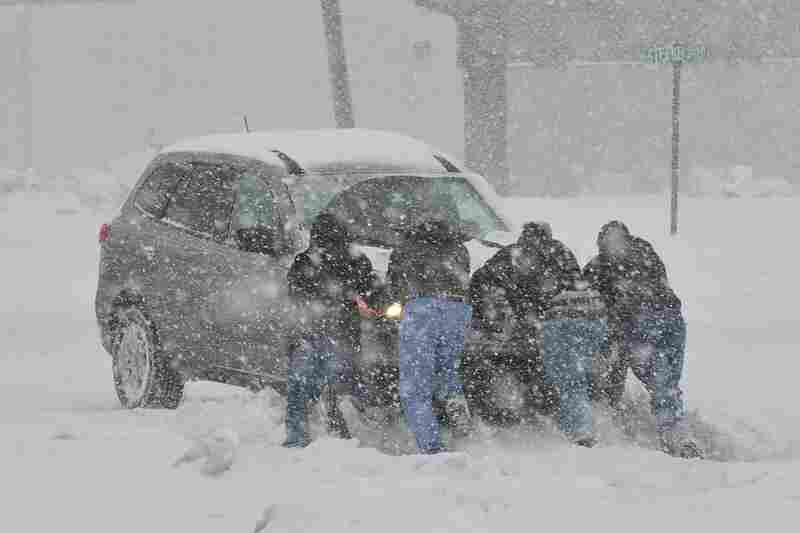 John Wood delivers heating oil in Trenton, N.J.
Good Samaritans help push a stranded motorist stuck in deep snow in Bethlehem, Pa.
A man clears snow in front of DC Meat Market in the Chinatown neighborhood of New York City. 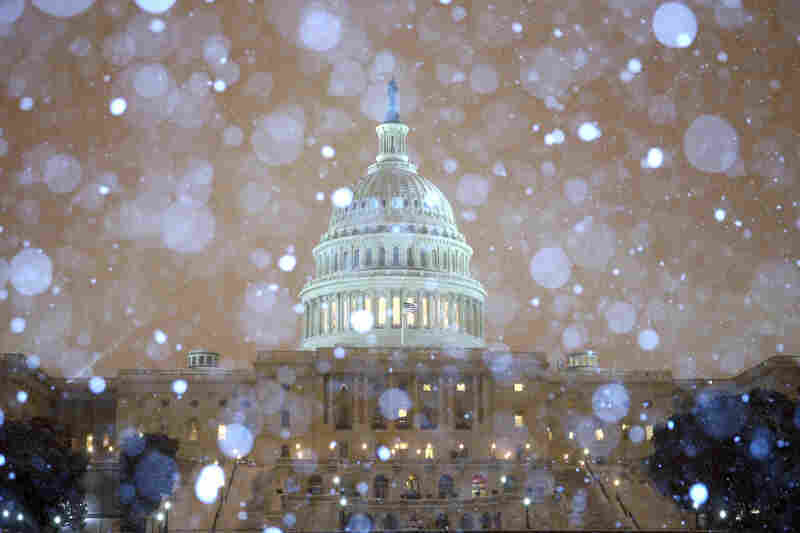 Snow falls in front of the U.S. Capitol building. The federal government's offices are closed Thursday, and more than 6,000 flights within the U.S. have been canceled. 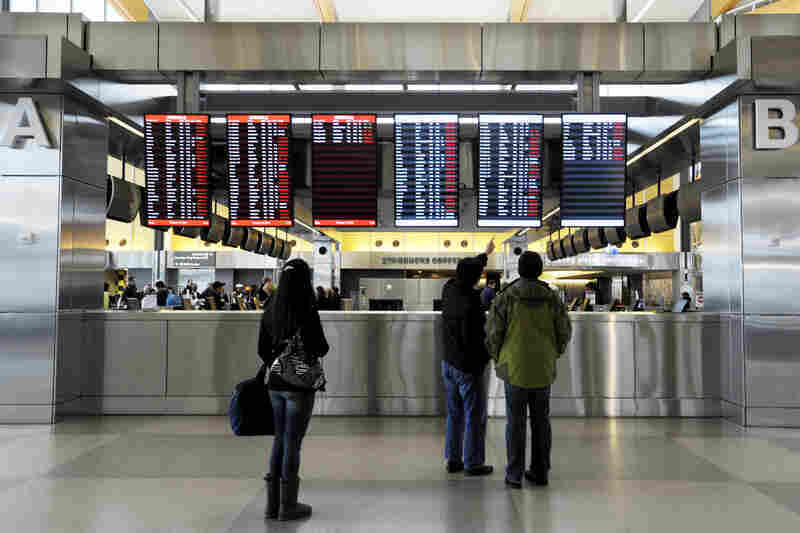 Travelers at Raleigh-Durham International Airport check on canceled departures, displayed in red, on Wednesday in Morrisville, N.C. More than 100 flights were canceled by 2 p.m. because of the winter storm hitting the area. 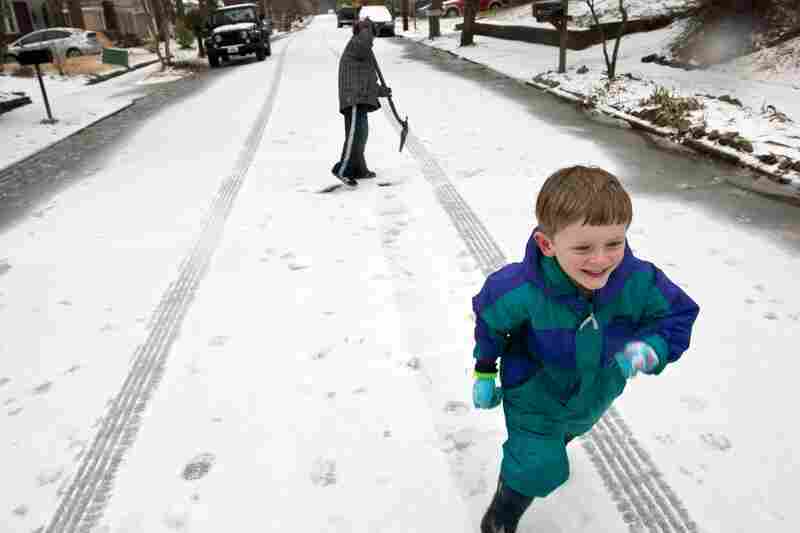 Milo Kortemeier runs away from John Staton after pelting him with a snowball in Decatur, Ga. Icy road conditions caused some businesses and schools to shut down in the greater metro Atlanta region. 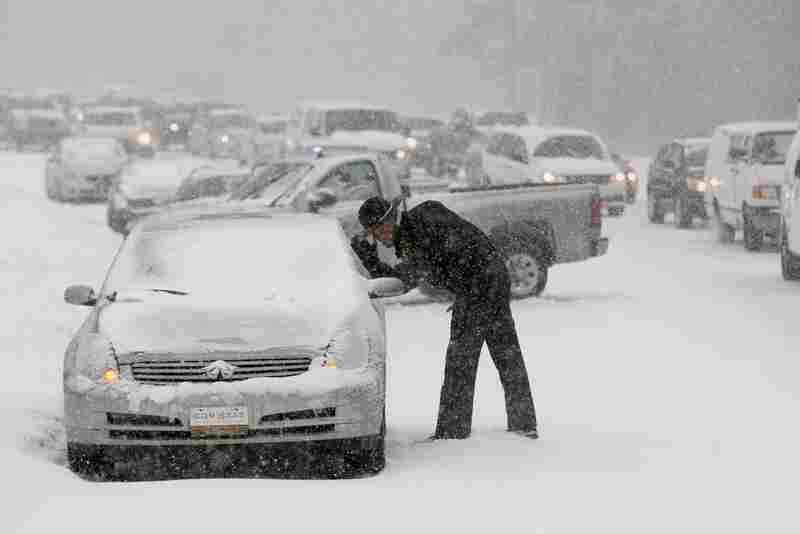 A Highway Patrol officer checks on the safety of a stranded motorist in Raleigh, N.C. The forecasters said it would be "crippling," "mind-boggling" and historic. Well, this time around we can't complain about them getting it wrong. Just as expected and feared, a dangerous winter storm has now spread snow, sleet, ice, freezing rain or some combination of all four from Texas to the Mid-Atlantic. Next up: the Northeast and New England. We've already seen how this storm can shut down traffic. It brought things to a standstill in parts of North Carolina on Wednesday. The Associated Press says at least 20 deaths were blamed on the storm. 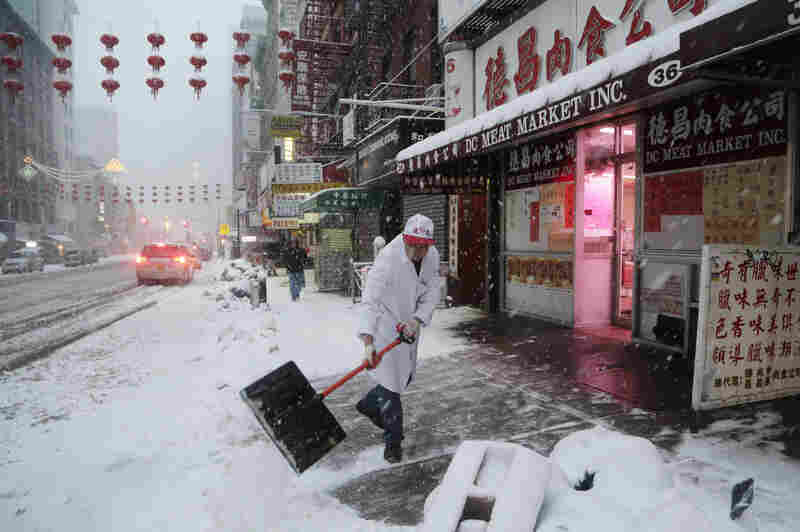 Among the dead: a pregnant woman struck by a mini-plow in New York City. Her baby was delivered via cesarean section and is in critical condition. As of midday, 14 deaths had been attributed to the storm, according to The Associated Press. They include a truck driver in Virginia, who was killed Thursday morning as he cleared snow from a road. His vehicle was hit by another dump truck. The Weather Channel walks through what conditions will be like for the Thursday afternoon and Friday morning commutes from Washington, D.C., north into New England. Basically, the news isn't too good. While the snow, rain and ice will gradually stop falling, the temperatures are going to be low enough for things to freeze. — WAMU in Washington, D.C.
What else has the storm done so far? -- Fatalities. By the evening, the death toll stood at 20, mostly in traffic accidents. A pregnant woman who was struck by a snow plow in New York City was among the dead. Her baby, delivered via cesarean section, was in critical condition, The Associated Press reported. Also among the dead, a man who was hit by a falling tree limb in North Carolina. -- Power outages. The weather conditions hit the South particularly hard. 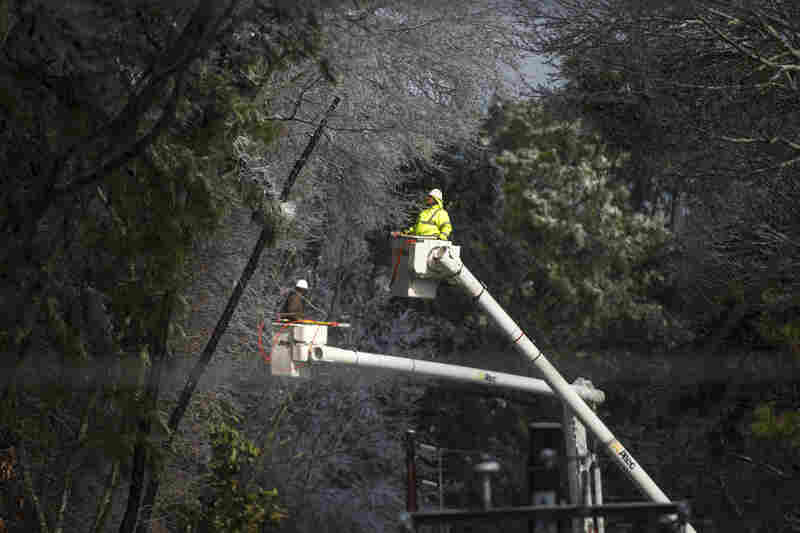 Utility crews worked to restore power to more than 750,000 homes and businesses, mostly in the Carolinas and Georgia. Atlanta alone had more than 200,000 outages. -- Roads. The snow has ended in Atlanta, but state transportation officials advised motorists that it would be best to stay off the roads. Still, they said the "concern [isn't] as high as it was before." North Carolina's Charlotte Observer said "it will take a few days for the region to recover." 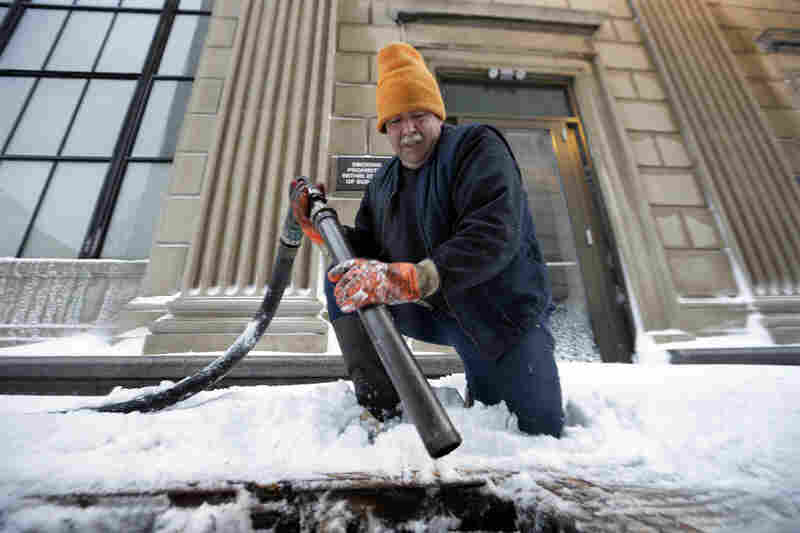 from snow-clogging heavy snow and freezing rain that left hundreds of thousands without power. 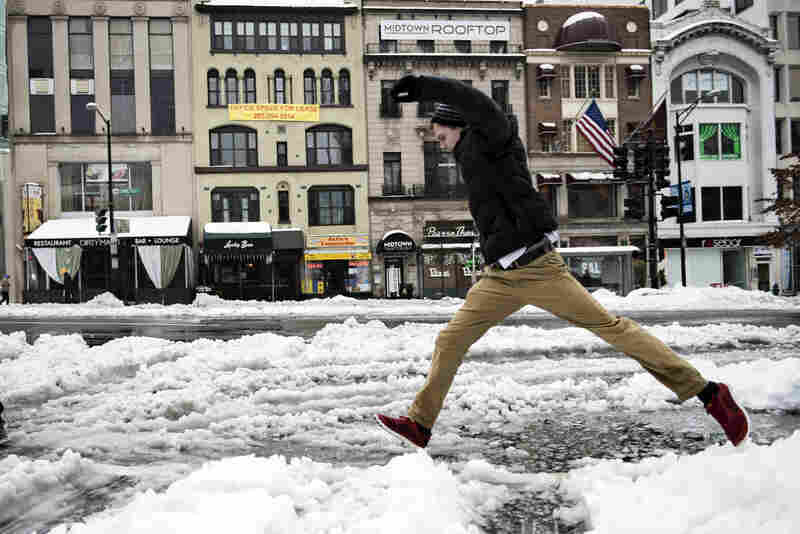 In Washington, D.C., officials said the snow emergency would end at 6:30 p.m. There was 8-10 inches of snow in some of the D.C. suburbs. -- Cancellations. Schools are closed across the affected states. The federal government's offices in Washington, D.C., were closed Thursday. The weather also grounded more than 6,500 flights within the U.S., according to FlightAware.com. Thousands more were delayed. Amtrak has reduced service in the Northeast and canceled many trains that normally head south toward Florida and the Gulf Coast. As for what's ahead the rest of today and Friday, the National Weather Service said the storm will continue to track Northeast, but the snow will begin to taper off Friday morning. "Warmer air streaming in off the Atlantic should keep most of the precipitation as rain for coastal New England, with some mixing in of sleet or freezing rain possible," it said. The service added that "heavy rain and mountain snow expected to continue across the Northwest corner of the nation."